A nationwide effort to bring community and industry together, "The Project Unity Tour" was founded by New York's, Cisco "DJ Cisco" Coleman, owner and operator of The DJ Cisco Radio Network, in 2017. A moving tour, the goal for "Project Unity" is to give back to the community, through volunteer, donations and food distribution to hungry men, women and children living on the streets of each stop on the tour. 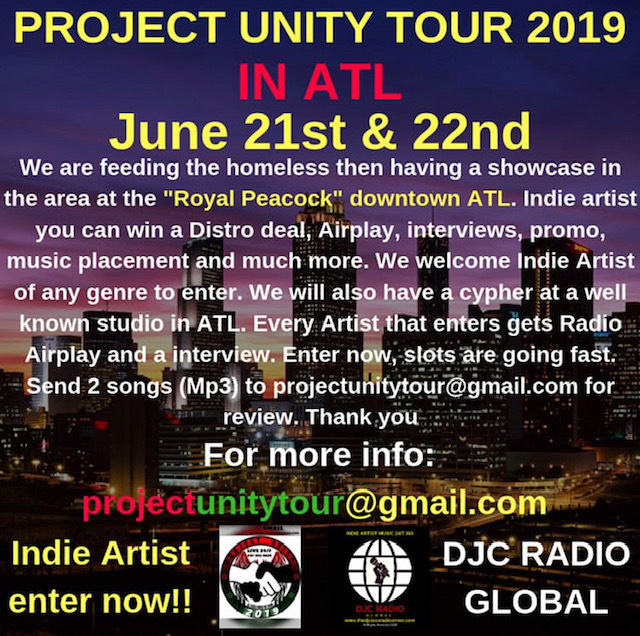 The Project Unity Tour returns to Atlanta, GA the weekend of June 21- 22, 2019 and you can help to truly make an impact. Through Sponsor, Artist, Attendee & Donation participation you can leave your imprint on The Project Unity Tour 2019.